Mike Schaefer placed third in the Adonis Index Transformation Contest. He has done an amazing job. Obviously he lost a lot of fat and managed to achieve great muscle definition. In today’s interview Mike talks about his journey of struggle. He explains how he was trying all sorts of different approaches and what finally helped him get into the Adonis Index Contest shape. Here take a look at his before picture’s and compare them to his afters. Once Mike lost all the fat he was able to finally see how much muscles he has built over the years. Listen to the interview to find out how he did it. If you are currently not very comfortable going to a pool party or to a beach with your friends you are exactly where Mike was a few weeks ago when he started the contest. Mike was working out pretty much his whole life, but he never had six pack abs or even a lean body. It all started several months ago with him wanting to change and making a commitment to get in the best shape of his life. The trouble was he didn’t really know what getting in shape meant and how to do it. After reading a few fitness magazines he decided to get the look of the guys on the cover and started following the advice he read in those magazines. He thought that in order to lose weight he needed to add some new muscle. You probably heard this in the past. Add an “extra” 20 pounds of muscle by bulking up to 200 lbs to speed up your metabolism and you will burn all the fat and your muscles will just somehow magically pop out. Mike calls this “muscling your way up to leanness”. Because he wanted to start losing fat and believed this approach to be true he started working out like a maniac and eating like a maniac as well. This is what he read in the magazines and believed to be true: “You need eat to be big. You need to eat tons of protein. Protein is a building block to all muscles, without it muscles just “fade away”. Without pre-workout and post-workout supplements you will not be able to build muscle, which means you won’t burn those extra 50 calories per pound of muscle and start losing fat.”..yadda yadda. Mike fell for all of it. 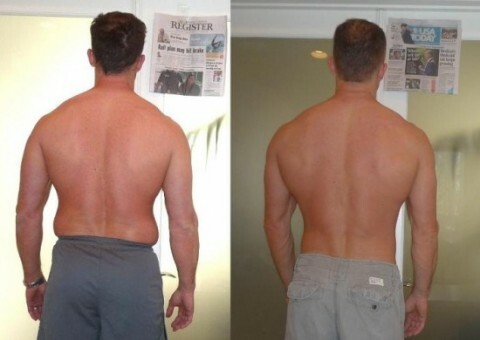 When you look at his before picture you will see that it didn’t really help him lose any fat at all. Quite the opposite. He didn’t believe in adding cardio or other activity, adding calories was on the radar not cutting them. He thought that if professional bodybuilders eat 7000 calories and spread that in 10-12 meals a day he should do something similar, so he started eating up to 4000 calories EVERY day. He ate as much as he could. He always made sure he ate lots of protein bars to get enough protein every day. He was taking lots of supplements that didn’t really do anything for him, but like he said, he was convinced that he should be taking them, so he did, despite the results. Does this sound familiar? Have you ever tried something like that in the past yourself? If you did my guess is that you haven’t lost any weight at all. This is because fat loss doesn’t work that way and there is a much better approach. After Mike got to 210 lbs the fat was still there, he wasn’t able to see his muscles and that raised some self-doubt about what he was doing. Then he hit the 220 lbs and he got really worried, these results just weren’t part of the plan. It felt really uncomfortable, he started to be having some weird retention issues and even things like his ankles would get swollen. Not a nice thing to go through. Because his previous weight loss attempts resulted in weight gain and mostly fat gain he decide to look for a different approach. His new goal was to get rid of all that fat for a beach vacation and get six pack abs for the first time in his life. Here is what Mike did for this contest (the difference between the pictures above). Fat loss is pure math. There is no secret in specific food combinations or macro nutrient ratios. It’s all about calories in and calories out. Calculate your BMR (Basal Metabolic Rate). Mike decided to shoot for1000 calories deficit a day, which makes it 7000 calories per week (almost 2 pounds of fat loss per week). At first he tried to do it just through diet alone. He though that this will help him finally start losing fat. Well that didn’t really work as he explains he couldn’t sustain this. He decided to eat around his maintenance and not go below BMR, but instead create a deficit by working out and doing additional cardio. This pattern worked, he managed to keep his energy during the day, he wasn’t moody and he still could work out to max intensity in the gym. If you are a big guy like Mike, eating below your BMR might be way too strict and not possible to maintain for a longer time than a few days. However, cardio and additional physical activity might be the path for you if you manage to keep the calories around your BMR. This might be the key for you to finally start losing fat. Listen to the interview to get the complete picture of what Mike did to prepare for the contest photo shoot and find out what you need to do yourself.